Marieke Penterman with her cows at Penterman Farm. Photo courtesy of Marieke Gouda. When Marieke Penterman left Holland, moving to Thorpe, Wisconsin, she noticed there were no gouda cheeses to buy at the supermarket. Homesick for the mild-flavored cheese and already living on a farm with access to dairy cows, Penterman decided to get into the cheese-making business in the early 2000s. Some were skeptical. A neighbor asked, "What is gouda?" and questioned if there were enough Dutch people in the area who would buy it. Penterman wasn’t deterred, and has since accumulated numerous awards for her Marieke Gouda, earning a thumbs up from her neighbor. "I’m very proud to say he likes it now," Penterman said. Adding to her collection, Penterman took home awards in the categories of 2019 First Runner Up and Second Runner Up for her Marieke Gouda Premium and Overjarige varieties, respectively, during the 2019 U.S. Championship Cheese Contest. Cheese-makers in Wisconsin won 168 awards in total this year. With a record 2,500-plus cheese entries from 35 states who participated in the contest, Penterman continued to rank as one of the best cheesemakers in the nation, piling on top of awards received in 2011, 2013 and 2017. "I think the good Wisconsin milk is one of our secret ingredients," she said. So, too, are happy cows, she said. Her affectionately-named Gouda Ladies — the cows in her herd of more than 400 — are pampered with rotating brushes and sand under hoof makes resting in the barn sort of like laying on the beach. 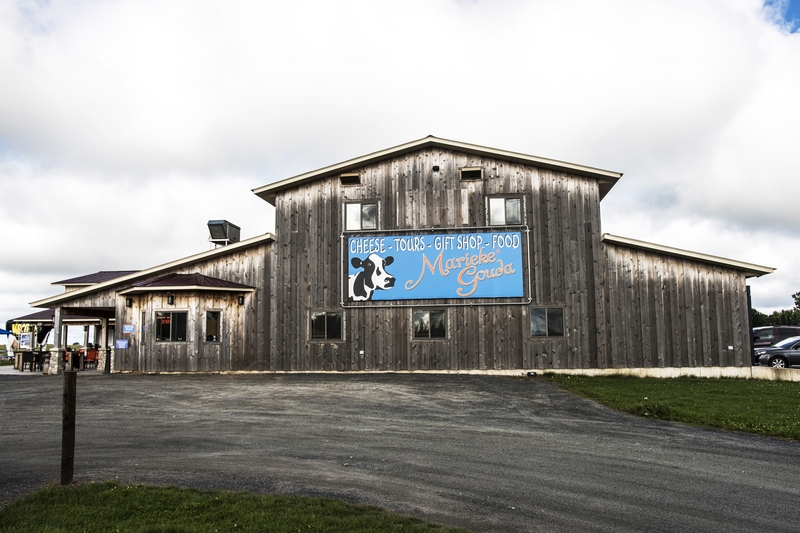 The warm, raw milk they produce that goes directly into cheese vats and eventually becomes a cheese wheel has earned Penterman numerous awards. There are about 9,000 aging wheels of cheese at a given time on the Penterman farm, and the average aging time is about nine months. But it depends. Some wheels are sold after 60 days of sitting in brine, and others age for two or three years. Penterman said a batch of about 8,000 pounds of milk is turned into about 800 pounds of gouda that at five weeks old is tested, particularly for salmonella, listeria, E. coli and Staphylococcus aureus. Penterman and her husband Rolf both grew up on dairy farms in the Netherlands. Although Rolf was determined to farm as a career, it’s an expensive practice in Holland. He emigrated to Wisconsin and Penterman followed about 18 months later and they wed in 2003. Marieke Gouda took home two awards from the U.S. Championship Cheese Contest in early March.Photo courtesy of Marieke Gouda. After their first two children were born, Penterman got the urge to start her own business. To meet the requirement for being a licensed cheese-maker in Wisconsin, Penterman had to complete five courses, which she took at the University of Wisconsin-River Falls and UW-Madison, and participate in an apprenticeship for 240 hours. Penterman made her first batch of cheese with herbs, spices, cultures and equipment from Holland to get as close as possible to authentic Holland gouda cheese. "Certain herbs are just unique and you always try to find a niche in the market, so that’s why we went that route," she said. She gets a lot of questions about gouda being made from cow’s milk from people confused by the belief that gouda comes from goat milk. It is possible to make it from goat milk. Probably from camel milk, too, she said. "I always wonder if it’s because of gouda — goat," Penterman said, accentuating the aural similarities between the two.